Of course we all know, the core of the library, the largest book system in the world – unrivaled actually by any other system with an archive of some of the world’s most valuable books like an original print of the Gutenberg Bible (the first ever printed). 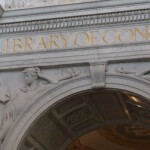 But, it’s the architecture and symbolism that makes the Library unique and fascinating. Our tour guide: "It's a Library Meat Head!!" Lining the ceilings and walls are symbols of education, profession and influential writers and leaders. But, to get the full sense for the building’s most important messages, you must take a formal tour. We squeezed into a large group encircling the low-volume Archie Bunker look-alike who was today’s guide. Since no headphones were provided, and the place was jam packed, it was hard to hear all the facts he was sharing. I was a little afraid to ask questions, for fear of being called a “meat head” or “ding bat” – seriously, the resemblance was uncanny. But, despite the difficulty hearing and the surly tour guide, we hung in there and eventually the crowd thinned and it became easier to follow along with our increasingly personable guide. But again, that’s just the surface. The message of acceptance, the power of knowledge and the importance of the written word scrawled along its walls and inside each and every page within it, that’s the real meaning. Here are some great photos of the interior – for more information about the Library, visit their official website here.